As Kanyakumari advances, one can see an array of windmills harnessing the sea shore winds signaling a traveler the ultimate experience ahead. The land of multicoloured sands, Kanyakumari is often referred as the end of Indian subcontinent. The trinity of three seas, the city bewitches you with its breathtaking views of magnificent sunrises and emotive sunsets. The much awaited ferry ride towards Rock Memorial and Thiruvalluvar statue intrigues a visitor and captures his awe. Also known as Cape Comorin, the southernmost tip of India is also one of the revered pilgrimages of southern India worshipping virgin devi Kanyakumari. Main Attractions : Vivekananda Rock Memorial, Thiruvalluvar Statue, Padmanabhapuram Palace. Geographic : Located at southernmost tip of Tamil Nadu is Kanyakumari, the southernmost end of the Indian subcontinent. Famous As : Apart from being a pilgrimage, Kanyakumari is famous as the point where one may witness the actual confluence of the Indian Ocean, Bay of Bengal & the Arabian Sea. By Air : The nearest air connectivity is through Thiruvanathapuram. By Road : Madurai, 6 hours, Chennai, 16 hours, Rameshwaram, 9 hours, Thiruvanathapuram, 3 hours. By Railways :Kanyakumari is well connected to Chennai & Thiruvanathapuram. The longest single train ride in India, the Himsagar express, covering 3374 kms in 74 hours has its terminus at Kanyakumari. Kanyakumari has long been a centre of culture & art; it finds mention in Ptolemy's writings as a center for pearl fishery. Ruled & patronized by the Cholas, the Cheras, the Pandyas and the Nayaks all of whom have left vestiges of their legacy in the architectural beauty of the temples in this area Kanyakumari has inspired generations something to be experienced as a part of Kanyakumari tour. Standing 500 meters off the mainland is the monument with which Kanyakumari has come to be identified with: the Vivekananda Rock Memorial built in 1970. It is said that in the year 1892 Swami Vivekananda swam to this rock and meditated about the past, present and future of India and gained enlightenment to become modern India's greatest reformer and philosopher. The rock also has mythical & religious importance, & is considered sacred to Devi Kumari. A meditation hall, incorporating different styles of temple architecture from all over India is attached to the memorial for visitors to meditate. Another feature which draws visitors to this spot is the visible confluence of three seas - Bay of Bengal, Arabian Sea and Indian Ocean seen from these rocks. 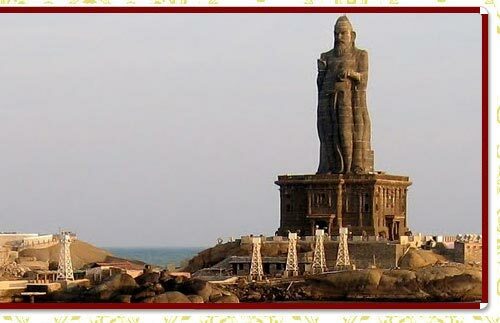 Standing a gigantic 133 feet (40.5 m) tall is the stone sculpture of the Tamil poet and saint Tiruvalluvar. 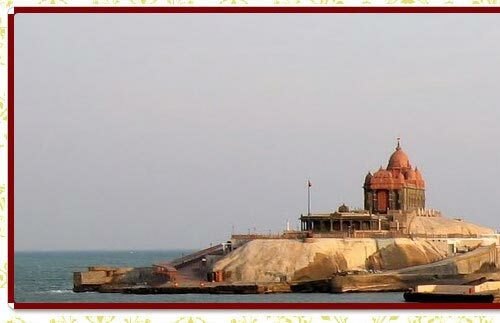 Opened on January 1, 2000 it is located atop a small island & is part of Kanyakumari city tour. The beautiful statue has a slight bend around the waist reminiscent of the classical Indian dancing pose of the Nataraja, the dancing god. The statue stands upon a 38 foot (11.5 m) pedestal that represents the 38 chapters of "virtue" in the Thirukkural. The monument was struck by the Indian Ocean Tsunami on December 26, 2004 which it withstood with hardly any perceptible damage. Located within the Padmanabhapuram Fort, a redoubtable granite fortress with surrounding walls around four kilometers long is the Padmanabhapuram Palace. 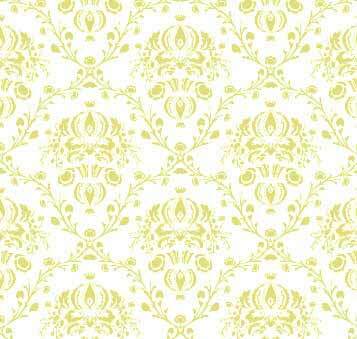 The setting is very scenic located at the foot of the Western Ghats with the river Valli flowing nearby. The palace was constructed around 1601 AD & the palace complex is one of the best examples of traditional Tamil Nadu's architecture. The Palace is one of the most important tourist place in Kanyakumari.